The Café unter den Linden (German for: Café below the lime trees) is a cute little hideout in the energetic quarter of Sternschanze. This doesn’t offer just coffee and freshly baked cake: you can also go there for breakfast, have a nice lunch (menu changes regularly) or a drink with your friends in the afternoon. The Café unter den Linden has newspapers and magazines on display for its customers. When the weather is nice, you can enjoy your food or drinks outside in the little garden – below the lime trees. No matter if you’re craving ice cream, pie or just an hour to sit and relax: the Café unter den Linden is a great place to do all of that. 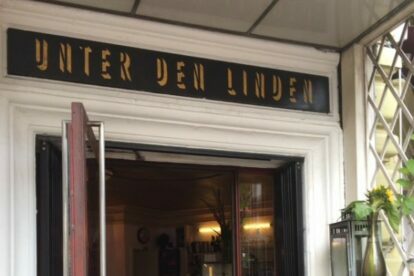 While located in the buzzing Sternschanze, the Café unter den Linden is off the main road and therefore a quiet and relaxing place. I particularly enjoy the quietness, which is not very common in the huge city of Hamburg.